After a bit of deliberating, I signed up to GLOSSYBOX this month, and, weeks after the rest of the subscribers got their January box, I got mine. For those of you who haven’t heard, it’s a monthly subscription service (costing £10 a month, plus postage) of beauty products. 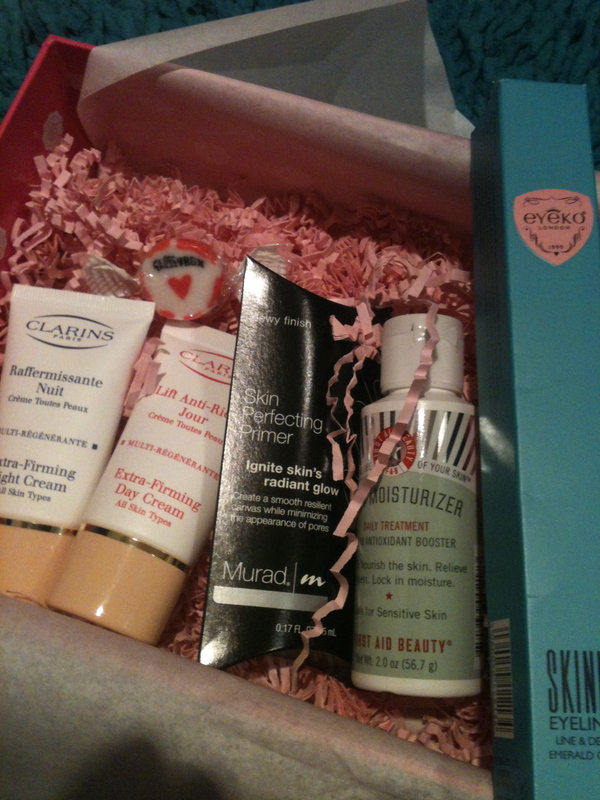 Each month they send a box of five sample sized products for you to try and review. If you like them, you can often buy directly from them at discounted rates. Every month you also review the products you’ve been sent, earning points for a free box. You might have read the post I wrote when Minibreak Mummy sent me something from a box she’d received, and the quality of that made me think that I’d give it a go. The packaging is lovely. Although I like to think of myself as environmentally aware, I do get a bit excited by beautiful packaging. It’s a weakness, I know. I will make sure I re-use the lovely (and sturdy) pink box it came in, and I’ve already eaten the sweetie, so that’s taken care of! Clarins Extra Firming Day and Night Creams. I’ve been a fan of Clarins for a long time, mostly through my Mum who has used it for as long as I can remember. . In fact, the Extra Firming range, if I remember rightly, is one that she uses. Now, I’m not going to talk about being an older woman again and have been very happy with both of these samples. Lightly fragranced, rich and easily absorbed, they’re clearly a high quality product and really what I would have expected from the brand. Eyeko Eye liner in Emerald Green. This was a full sized product and I’ve used (and been complimented on it) quite a lot. I love the colour, which I wouldn’t have chosen on my own. It’s soft and gentle on the eye, easy to smudge to create a softer line and long lasting. I recommend this one lots. Murad Primer. I’ve known of this brand for a while, but not had the chance to try any, so I was happy to be given this chance. It’s a tinted primer, which I wasn’t expecting, as most of the other primers I’ve used have been colour free. It’s light and easy to apply and although I’ve only used it a couple of times, I do think that it helps to even out my skin tone. F.A.B. Body Moisturiser. Designed for sensitive skin, this moisturiser is scent, paraben and colour free. Although initially it felt quite greasy to the touch, it sank in really well and left a long-lasting softness to my skin. I really liked it, and now could do with industrial quantities of it to help me get my legs out of my Winter hibernation mode and ready for tights-free skirt wearing in the Spring! A success, then. I’m already looking forward to next month! I had exactly the same products in my Glossybox! Best subscription ever! I’ve been really pleased with it. Looking forward to next month already! I never thought about doing that! Great idea. I’ve really enjoyed this one – keeping my fingers crossed that the quality remains so high!